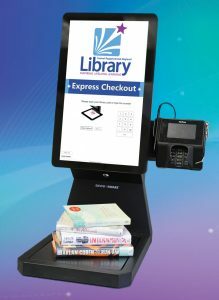 The library's new Express Checkout machines, coming soon to all library branches, will offer a quick and easy option for checking out materials. Customers will still be able to have their materials checked out by library staff, but those looking for a self-service option will enjoy Express Checkouts. Express Checkouts are another way the library continues to respond to our customers' needs. Check out all you can carry and happy reading!